*	Is this a gift? 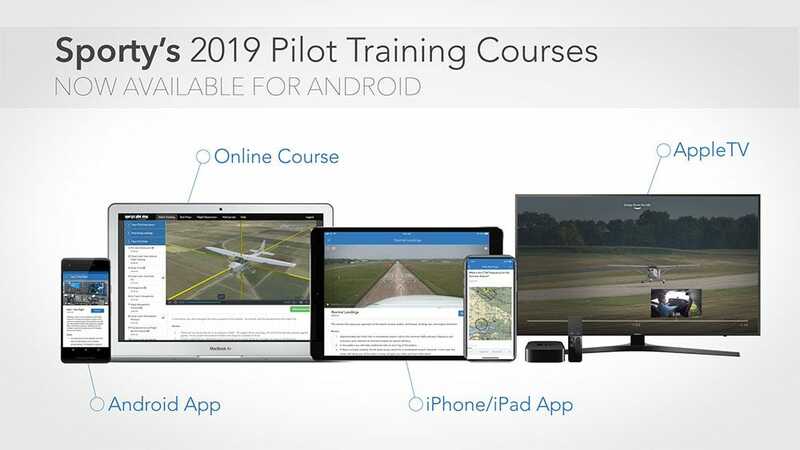 New content, flexible app options, and smart study tools all combine to offer an unmatched training experience in Sporty's 2019 Learn to Fly Course. The powerful test prep tools mean you’ll be prepared to ace the written test, but that’s just the beginning. 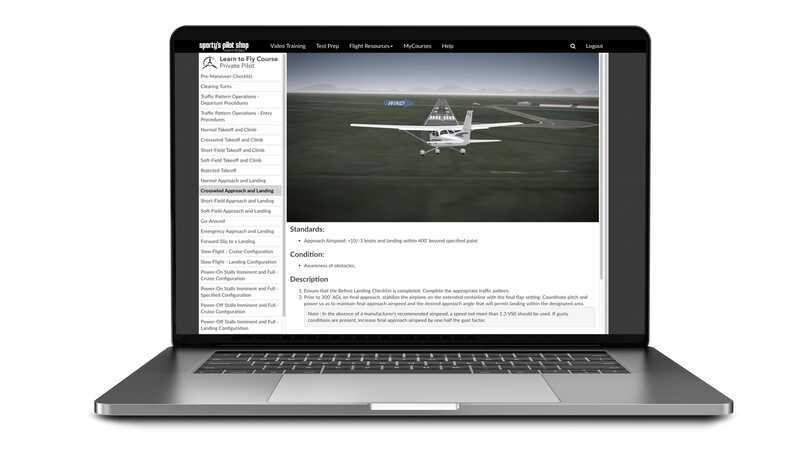 In depth video segments focus on real world flying, detailed lesson plans help organize your training, and Sporty’s flight instructors are always available to help. We know you’re busy, so our course is available almost anywhere. Use our online learning platform for complete access to videos and quizzes anywhere you have an internet connection. There’s no software to install – just log in and start learning. Or use our dedicated mobile apps for iPad, iPhone, Android, Apple TV, and Roku, which allow you to download videos for offline viewing. Progress automatically syncs between all formats so you can start a study session on your phone and finish on your laptop without missing a beat. When you complete the course, we’ll give you the flight instructor endorsement to take the written test—instantly! You can take this endorsement to the FAA testing center, and log it in your ForeFlight logbook. It's complete preparation for the FAA Knowledge Test. 3. Pass all your tests—guaranteed! Our course is so complete we guarantee you’ll pass all three tests: the written, oral and flight. Our video segments make complicated subjects like aerodynamics and weather easy to understand, so you’ll impress the examiner. 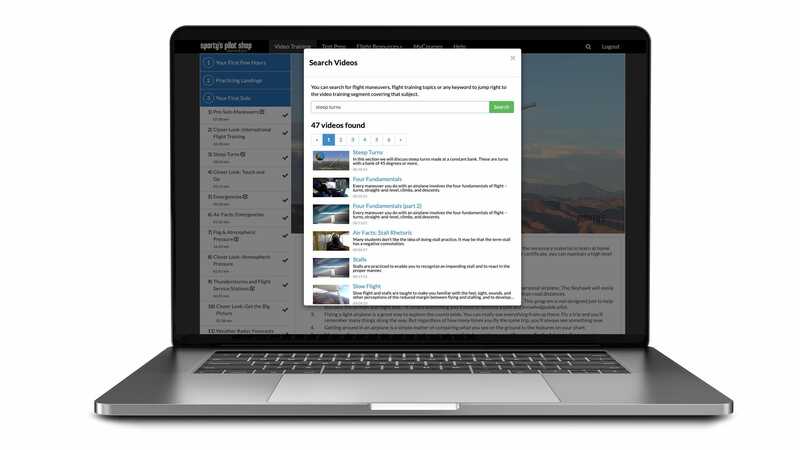 Plus, our Airman Certification Standards Study Guide cross-references every required task to the videos, making it easy to review for the checkride. Sporty’s courses are famous for their HD video and 3D animations. Not a boring ground school, we put you in the cockpit for a real world look at what flying is all about. You’ll see the flight maneuvers from the left seat, and you’ll hear actual communications with air traffic control. Plus, each video segment includes helpful review notes for efficient studying, and many also have review quizzes to reinforce key concepts. In addition to the comprehensive video segments, Sporty’s Learn to Fly course also includes a detailed maneuvers guide. All 32 maneuvers you might be tested on are included, with a 3D animation of the maneuver, narrated procedures, common errors, and completion standards. It’s a great way to review for the checkride. You’ll ace the written test with our interactive tools. 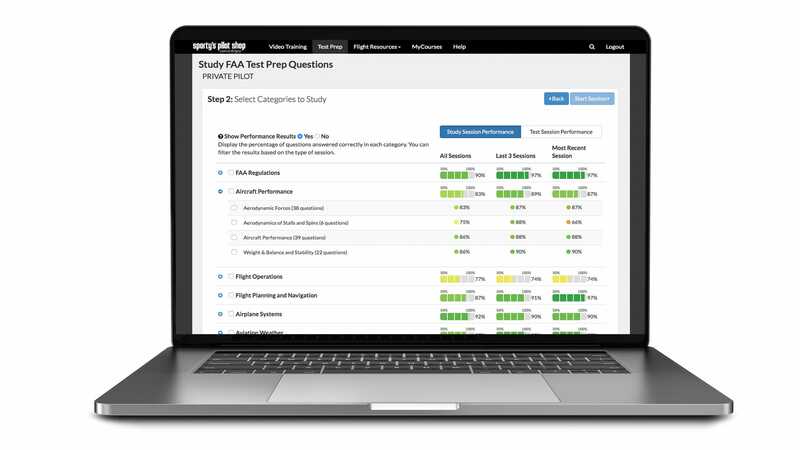 Create customized study sessions from the actual FAA test questions and see the right and wrong answers, plus plain English explanations written by our team of CFIs. Detailed analytics show you which areas need the most help, and allow you to study only the questions you’ve missed. Then, take a practice test that simulates the real knowledge exam you'll have to pass. We make it easy for your instructor to follow your progress through the course, so you always stay in sync with your in-person lessons. 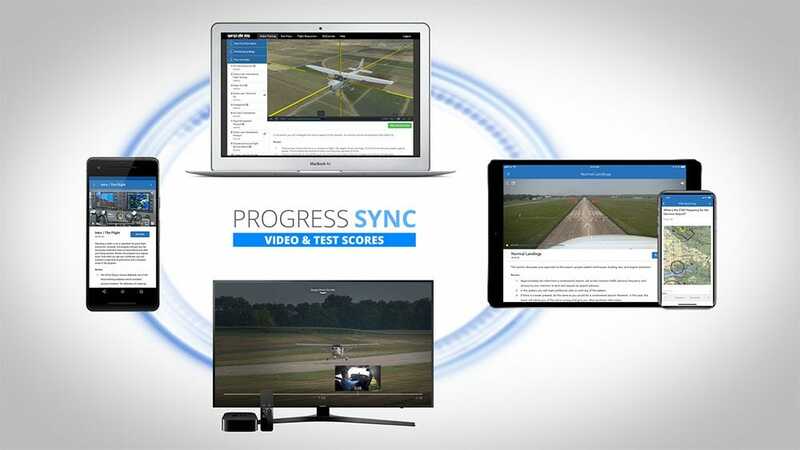 Invite a CFI to see your practice test scores and review your video progress. If you're stumped by a difficult subject, talk to the experienced flight instructors at Sporty's. We have a team of over 25 CFIs on staff at our flight school, training students every day just like you, so they can offer quick, helpful answers. Just click the Ask a CFI button to send a message. Research shows that pilots learn better when they use a high quality syllabus. We include a complete Training Course Outline as part of our course – the same one we use in our flight school. It includes detailed outlines for both ground and flight lessons. Think of it as a bridge between your at-home study and flight training. 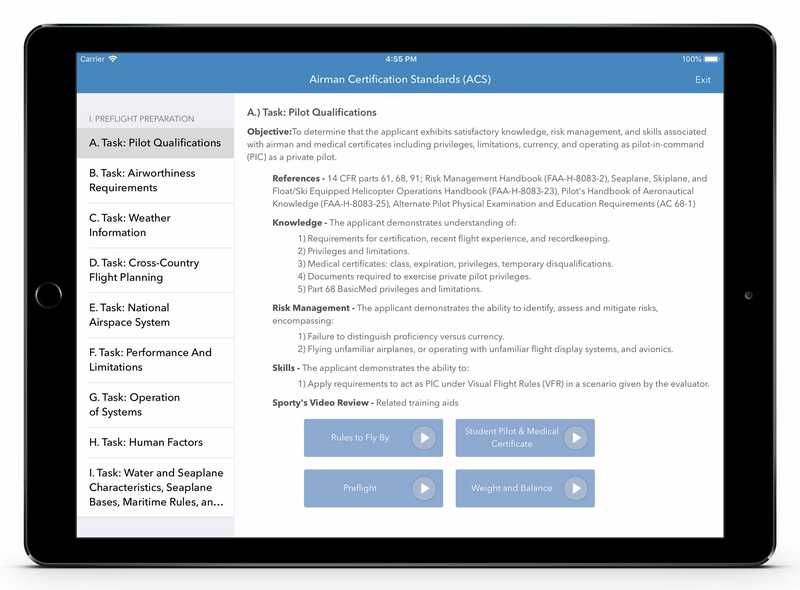 Our course also includes the full text of the FAA’s Airman Certification Standards (ACS) - your guide to the checkride - and cross-references each task to the video segments. When you buy a Sporty's course, you're gaining access to a a training platform that's always up to date and always improving. We are continually adding new video segments to reflect new regulations and technology. We also refresh our FAA test question database regularly, so you don't study outdated topics. There's no additional fee or subscription to receive these updates - just log in and learn! 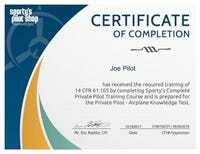 Covers Private, Recreational, and Sport Pilot - train for one or all three certificates with one course. Download videos for offline viewing in the app or stream them with an internet connection. Automatic progress sync between all formats. Air Facts segments go beyond the textbook to make you a proficient pilot. Review notes and quick quizzes after most videos help you review your progress. Closed captioned videos help students whose first language is not English. 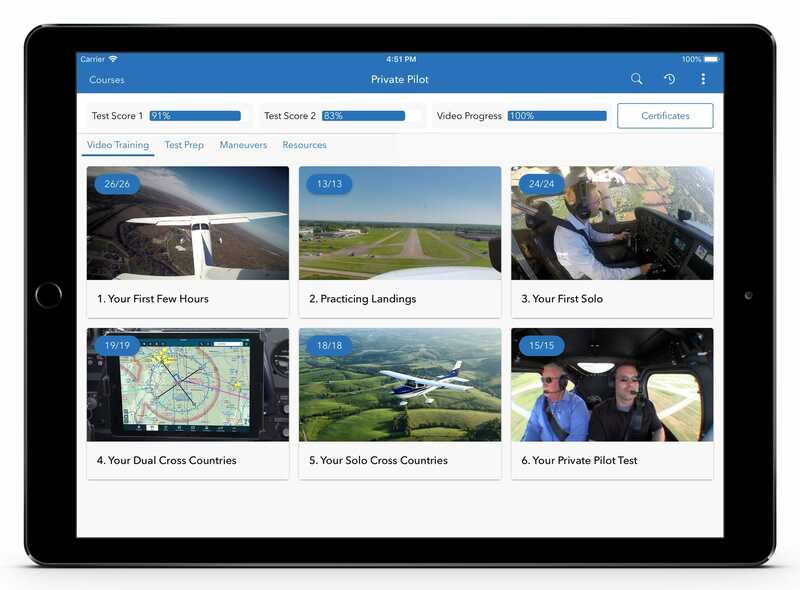 Connect to your ForeFlight logbook to log your written test endorsement. 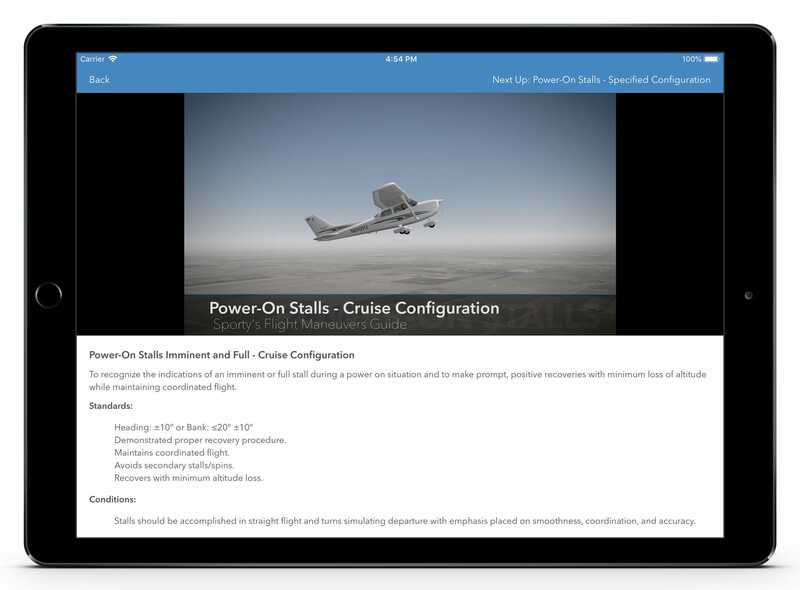 Redbird GIFT integration: use Sporty's course with Redbird simulators. Earn FAA WINGS credit and save on your insurance. Automatic updates mean you learn the latest information. Stop dreaming and start flying at Sporty’s world headquarters in Cincinnati, Ohio. 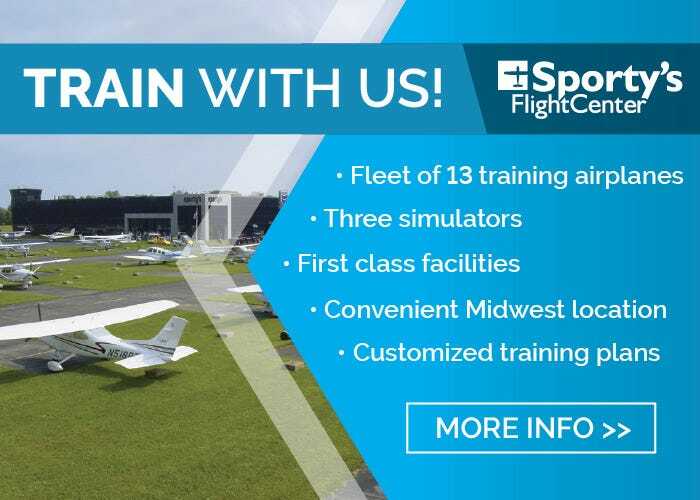 The same experienced, professional instructors that bring you Sporty’s award-winning pilot training courses on DVD or online are available to fly with you at the renowned Sporty’s Academy Flight Training Center – Clermont County Airport (I69). Whether you want to enroll in a training course to earn a pilot certificate or simply take a flight, Sporty’s Academy is here to serve your aviation needs in a fleet of impeccably maintained aircraft. SportysAcademy.com or email Fly@SportysAcademy.com. The iPhone and iPad apps were updated with an improved Test Prep interface. 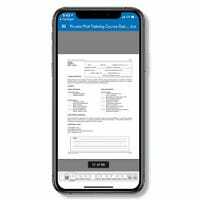 The new design includes colorblind accessibility enhancements and provide a better experience when studying for FAA tests on the iPhone's smaller screen. 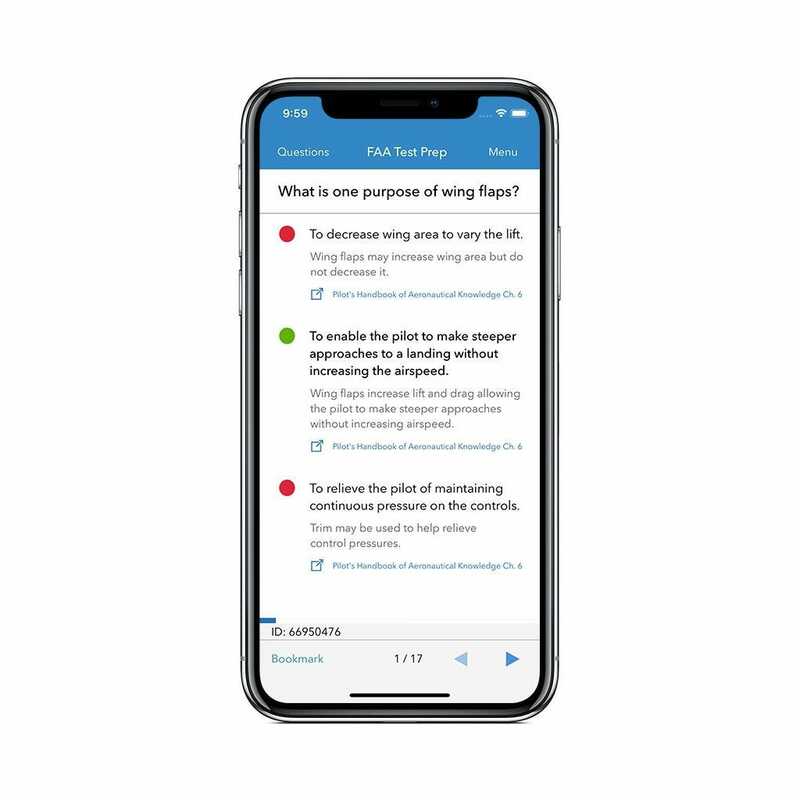 The Android app now includes complete FAA test prep features, allowing you to study test prep questions, answers and detailed explanations for the Private, Sport and Recreational Pilot tests. The app also now allows you to take simulated practice tests and earn your knowledge test endorsement based on your Android test results. - Test Prep Answer References: each question includes a link to view the specific FAA reference book or resource from which the question is based. - includes the new version of the Airman Certification Standards (ACS), FAA-S-ACS-6B. Each ACS Task includes a video review section that allows you to quickly access the corresponding video training content. 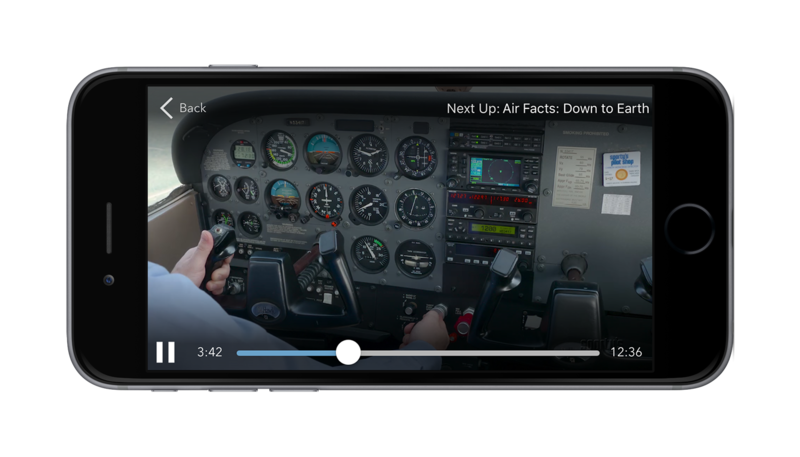 The Pilot Training iOS app for iPhone/iPad was updated to prevent downloaded video files from being included in daily iCloud backups. 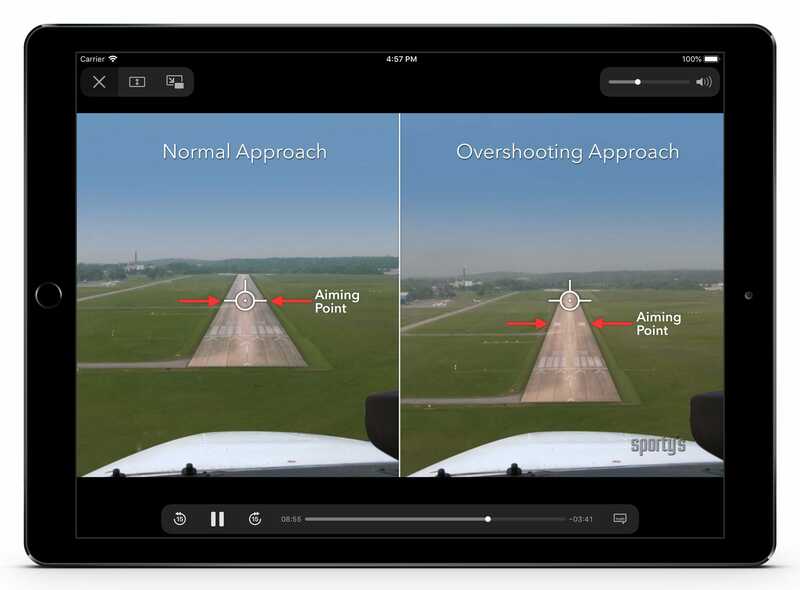 The Pilot Training iOS app for iPhone/iPad adds support for iPhone X. The video player in the app was updated to include a faster and improved video player with new features: rewind/fast-forward 15 seconds, AirPlay directly to AppleTV, video subtitles. 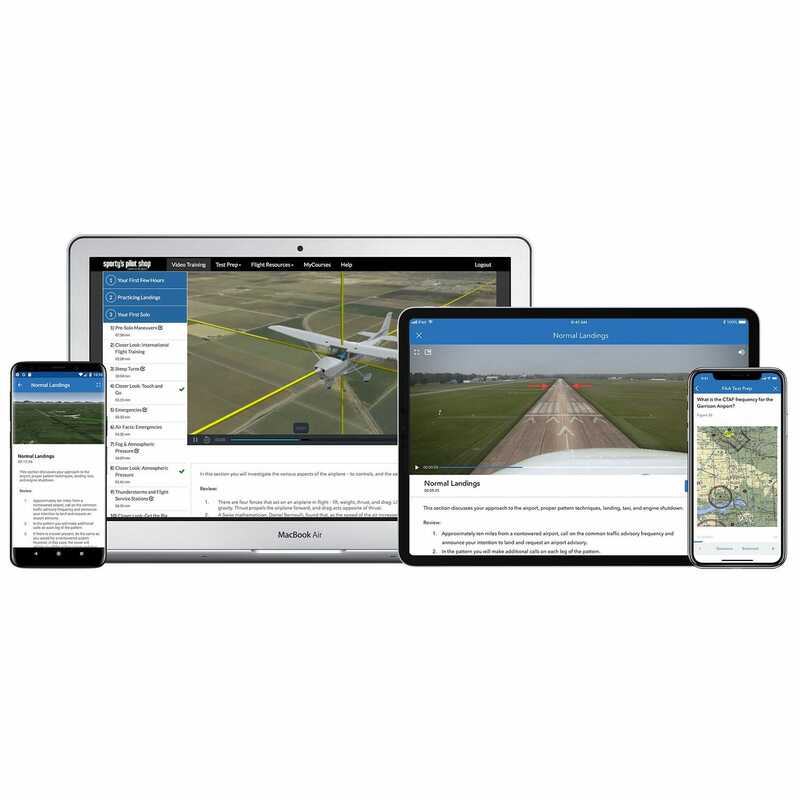 The 2018 Learn to Fly Course now includes all 3 platforms for the same price: online, iPhone/iPad app and AppleTV app. This update also includes a new tracking system to keep your video and test score progress in sync between all 3 platforms. 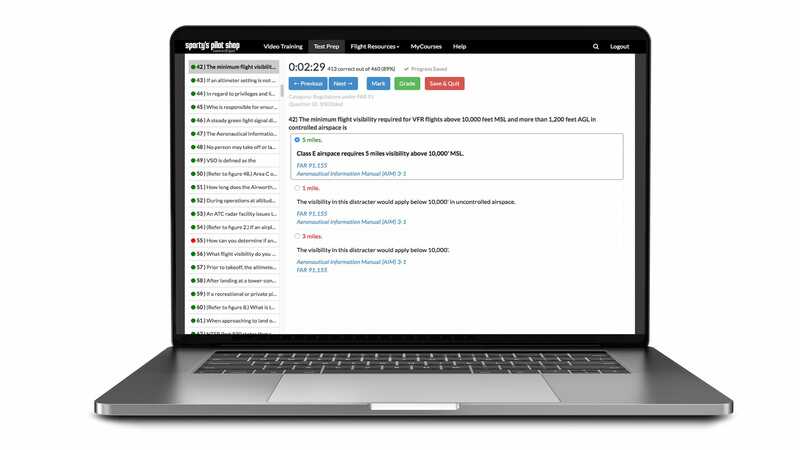 - updated to include the 2017 Airman Certification Standards (ACS) for Private Pilot, which is fully integrated with the video training to cover each task and maneuver required for your checkride. - the interactive maneuvers guide has come to life with 31 new animated HD videos, each narrated with step-by-step instructions on how to complete the maneuver. - includes new high-resolution figures and images for the written test prep component of the course, providing much greater detail when answering questions. Improved HD Video Playback—We've completely revamped the video playback in the course for a much better viewing experience. The course now detects your bandwidth and automatically play the highest quality video available (including full 1080p HD when available). The new video player also makes it much easier to fast forward within a video segment, and includes better progress tracking logic. When watching on an iPad or iPhone in the Safari web browser, you can also take advantage of the iOS 9 picture-in-picture multitasking feature. This allows you to "pop" the video out of the web browser and continue to watch the video while using another app. 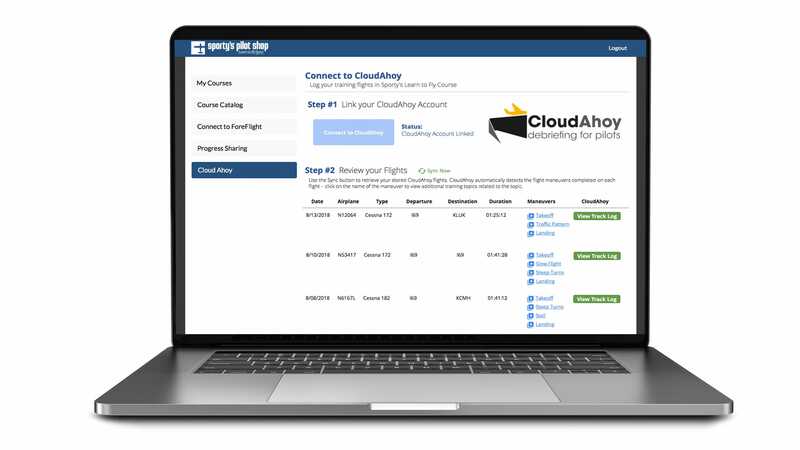 Ask a CFI—This new feature allows you to get in touch with the experienced CFIs at Sporty's Academy right from the course to ask questions about the course training materials, content in the FAA written test or other aviation topics related to your flight training. We've enhanced the Knowledge Test Endorsement request feature -- you'll now receive your endorsement certificate immediately after completing the course. And now your request FAA Wings credit will be processed immediately after course completion. This update adds the new FAA test prep supplement required for Private, Recreational and Sport Pilot written testing. The figures and legends are now displayed as full-color, high-resolution images, making it easier to see and interpret the information required to answer the FAA questions in the test prep section of the course. This update adds a new feature to the video training section of the app. 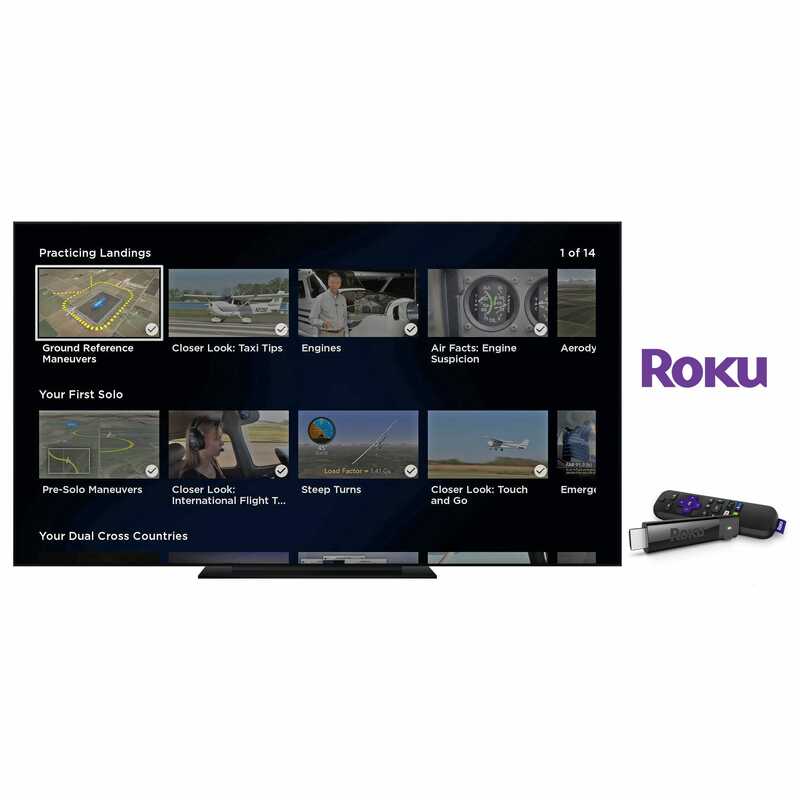 Now after viewing select video segments you’ll be presented with a short quiz containing FAA test questions covering content from that video segment. We’ve added a helpful new feature in the test prep section of the course that allows you to pause and save your progress during a knowledge test session, and return later to finish. You can also now review a detailed record of your past test prep sessions, and see your answer selections and explanations for each question. New HTML5 design means the course is compatible with all popular web browsers and mobile devices, including iPhone, iPad and Android. The Learn to Fly Course now includes training for all 3 pilot certificates: Private, Recreational and Sport. You choose the track that’s right for you. Improved video streaming for lighting-fast playback. Requires Chrome, Safari 5+, FireFox 9+, Internet Explorer 10, iPad browser. Our expert pilots are available to answer your questions. The course is very complete and easy to use. The web base allows me to pick up where I left off on the bus, at lunch time and anywhere I get a minute. The practice tests are challenging and like the FAA exam. I'm going through the process of getting my PPL after having given it up 30 years ago and I find this course easy to use. The ground school lessons are great so far! The videos are super well-made, with good visuals, and script/information. I've been impressed by the UI both on desktop and through the Android app (no issues or bugs). I'm hopeful that my access to the information is for life and that Sporty's updates their content as FAA rules evolve. 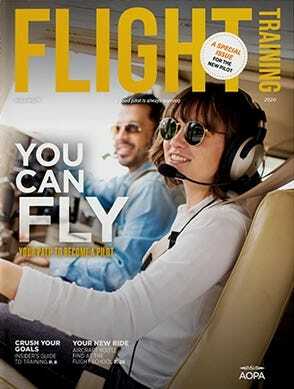 Super comprehensive and includes access to flight training exercises to follow with a flight instructor. Great update to date videos and easy to understand material. The app is straight forward to use. I'm was a rusty private pilot and decided to go over it all again. Why not? You get it all, in this super value course. Get the Private Pilot, Sport Pilot, Recreational Pilot and what I initially needed, Flight Review course, for all one price.? WOW! And they go the extra mile in each course. Excellent review, made me feel super confident to get back in the left seat :). Get it and feel confident. I love the course. Videos are easy to follow, a little dry but not terrible, I do understand the point is to give you as much information as quickly and cleanly as possible to avoid confusion. And the practice quiz at the end of the video segments are a huge help and make it easy to go back and re learn what you missed. I do wish that somehow they could make these videos more interactive for people that learn by doing or learn with their hands like me. I struggle with books, but the videos are the best I could get. I came here after realizing the Gliem course is pure misery. So far so good. I’m powering through the videos, taking a practice test here and there to see if I’m absorbing what I’m watching and it’s going fine. Has everything! Has a super easy layout would recommend to any aspiring pilot! Great Refresher Tool for Me! Private Pilot Test Prep is proving to be an excellent refresher tool to me, a long inactive pilot. I’m learning both how much I remember as well as how much has changed. I’m also discovering the things I’m fuzzy on. Well done and so easy to use. The videos and quizzes thoroughly prepare you for every flight. My new CFI was amazed at my practical knowledge and impressed with how well I actually handled the plane with only 3 1/2 hours with my first instructor. Get this! 1)Will this course enable me to pass the oral portion of the FAA test as well? 2)How does it help with the flight portion of the test? Does it take you thru the steps of flying the aircraft? BEST ANSWER: Yes, it is total preparation - the written/knowledge test for sure, but also the oral portion and the checkride. While there's a written test prep tool to practice all the questions, the videos are focused on really teaching the material so you understand it, not just memorize it. You'll also get a preview of the checkride in the last part of the videos. This is a complete course. Can I also use the iPhone/iPad app if I only buy the online version? Or do I have to buy both the online and the iOS version in order to watch the videos on both my PC and my iPhone? 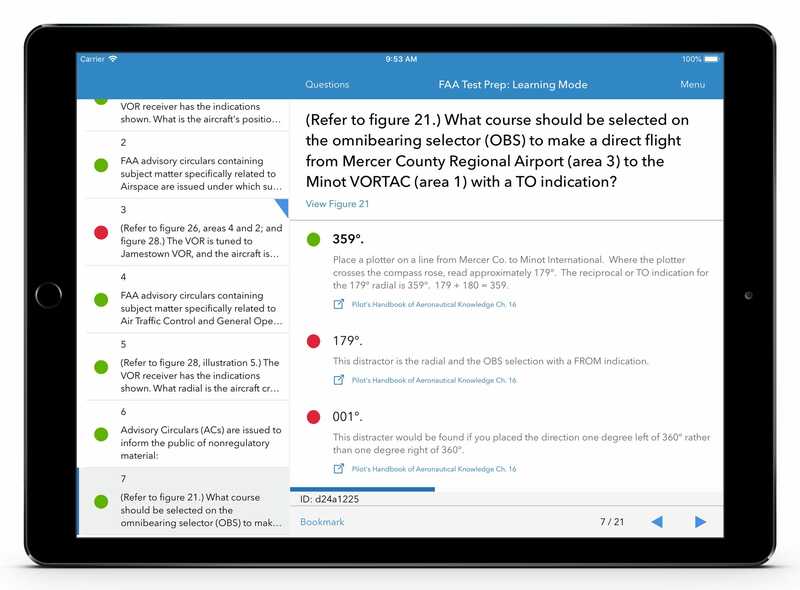 BEST ANSWER: With the new 2018 courses, you get access to the online version, the iOS app, and the Apple TV app - all for the same price and all with automatic sync. Just buy once and use it anywhere. For the online format how long is the material available to you? BEST ANSWER: There is no expiration date - you get free updates delivered automatically. Is this ground school acceptable? 1)Do the FAA testing centers accept the Sporty's Certificate of Completion? Yes. 2)Is the training sufficient to pass the test? Yes. I just finished with the video training and practiced the questions until I mastered them. I scored a 98% on the FAA Test (missed one question). 3)Are the videos any good? Absolutely. They add a lot of context to the questions that you can't get by just reading the questions and memorizing the answers. 4)Are the test questions identical to those on the test? Not exactly. Some are, some are different. For example, no practice question addresses the test question that asks about the Mode required on the transponder when squawking 1200. The answer is to set the transponder to "Mode 3/A Code 1200". It was the only question I missed. Can the "Learn To Fly Couse" be used for 2 people in the same family? My son and I are planning to take the course. Is it possible to buy one course & both my son and I use it? BEST ANSWER: Yes, you can both use the course, however only one person is able to receive the endoresement for the FAA written course. Does it have a quiz at the end of each section or chapter? BEST ANSWER: There are short quizzes (2-3 questions) roughly every other video. These questions do not effect the progress of your lessons if answered incorrectly. They are there to help you. I am debating between the VFR Refresher and the Private Pilot Test Prep course to catch me up on everything since I haven't flown in 20 years. Which product is more thorough? BEST ANSWER: The Learn to Fly course is much more thorough. I purchased the Sporty's online Private Pilot Course a year ago. Do I need to upgrade that course to this 2017 version? BEST ANSWER: Just log into the course and you will have the most current program. Can I also watch the videos on my iPhone if I buy the online version? Or do I have to purchase both the online and the iPhone version in order to watch the videos on both my PC and my iPhone? BEST ANSWER: With the 2018 course, you get access to the online, iOS app, and Apple TV app - all for the same price and all with automatic sync. Just buy once and use it anywhere. You can watch them anywhere you can log in. They are very good. Is this program part 141 approved? As in if I take this course can I take the test to begin flight training at a part 141 facility? I've gotten mixed answers here. I am trying to get around the 35 hour in class requirement with an instructor, hoping this will allow me to save a few dollars. BEST ANSWER: A part 141 program is approved by the FAA for each flight school that teaches a 141 program. If the flight school that you are going to attend is using our program in their part 141 flight school it would be approved for that flight school. It is approved for use here at Sportys for our part 141 flight school. 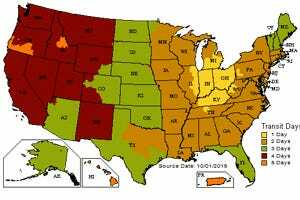 Where can we find a list of part 141 flight schools using your Sporty's Learn to Fly? I currently have the pilots handbook of aeronautical knowledge and Airplane Flying Handbook. 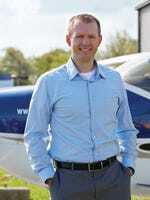 Will I need to purchase other books or products to go along with the Sportys Private Pilot Online Training curriculum? I'm trying to decide if I should get the kit since I already have two of the books. BEST ANSWER: The only other book that would be needed would be the current FAR/AIM. Does this course take place of any classroom training or costs of flight school? BEST ANSWER: The course is a complete ground school. You can obtain your FAA written before you begin your actual flight training. Your instructor may still want to go over the information to ensure that you have the required knowledge. BEST ANSWER: This course covers the basic. We do have a VFR Communications course that go into a little more detail. Have the issues been addressed about the quizzes to matching up with the videos? BEST ANSWER: I have not had an issue with questions not corresponding to the videos. In other words, the quizzes match the videos, so I guess it has been fixed. yes,very refreshing quiz ,that helps you to learn. If purchased as a gift for my son how long would he have access to the program? BEST ANSWER: He is only 10 and couldn't get is license for 6 years but would like to start now. Would he get all the updates? Yes, he would have access to all updates. We can mail an activation code that will arrive in 3-5 days after the purchase. Can this course replace reading a private pilot book? BEST ANSWER: Yes, it can be used as a stand-alone course. What is the guarantee for passing the written, oral and checkride? BEST ANSWER: If you do not pass we will refund the cost of the course. Is there any discounts for veterans? BEST ANSWER: We do not have a military discount. What items other than the course will I need to get the most out of it (the course)? BEST ANSWER: The course is complete. If you are looking for an additional item I would recommend taking a look at our deluxe kit item 4100A. What would the youngest appropriate age be for the course? BEST ANSWER: The question is a bit subjective as age can be a factor but it's more about the ability to understand some complex scenarios. Flying involves the understanding of aerodynamics and the application of that theory to actually flying an airplane. A student pilot must be at least 16 years old to solo an airplane. The solo flight is one in which there is no instructor in the airplane for the duration of the flight. Many young pilots start primary flight training before their 16th birthday and many start the ground school prior to that. In short, what I am saying is that it doesn't make sense for anyone younger than 15 years of age to undertake this course however, if they want to learn about flying, weather, navigation planning, and communications, from the perspective of being a pilot, then they can certainly take the course. There may be aspects of it that make no sense whatsoever but again, it depends on the student and their aptitude. interesting question. The course is intuitive, progressive and well-laid-out for even the youngest of student pilots. I've been flying for more than 40years and I use the course (and others) as a means to stay up-to-date on techniques and information. If you have access to the internet and can read, this course will work for you. AS too as they can read at the appropriate level, and have exhibited an interest in flying, especially after having flown. I would say ages 15 and up. How far can I go? If I complete the course can I take the written + oral/P? Can I skip any portioms of a flight school by completing this course? BEST ANSWER: I took nothing but the Sporty class and passed the Sport Pilot written test with 88% with no studying with my CFI - nothing but Sporty's. For the oral, I imagine there'll be far more on the oral, performance, etc, but the Sporty's class is top notch! I think everyone should skip the 'ground school' at their flight school, not paying $60-$70/hr to have someone teach them what they can drill on their own at their own convenience for $200. CFIs are for dual instruction, imho, not for ground school, unless you have specific questions you want explained by them. If you complete the course and understand it, you should be able to ace the written. It will also help a great deal with the oral portion of the checkride. It basically takes the place of groundschool. This course is designed to give you the information to take the FAA written exam. It will also prepare you for the oral exam. The flight school will teach you to actually fly the required maneuvers. Can you log into this from different computers? EX: like my work computer at the office as well as my home computer? or do you download it directly onto a single computer? BEST ANSWER: The web based one can be accessed from anywhere. I have logged in from 3 different computers and my laptop. It's a streaming-based system. You can log in from your main computer and then watch it on your tablet. You can log in from anywhere but you can't download the videos. BEST ANSWER: Note that the Apple TV app only works on the latest generation (4th) Apple TV. Previous models do not have access to the Apple TV app store. Yes, you will need to download the app from the app store. Will the online program work with Android 5.1? I have a Lenovo tablet dedicated to learning to fly apps. BEST ANSWER: It needs a browser to access the online web url.I tried it on my Samsung S5 Galaxy and it works. Hope this helps. You can access it thorough Google chrome on your phone. How many hours of material? BEST ANSWER: Approximately 23 hours. BEST ANSWER: The course can be used by both IOS and Android apps. The online course is accessible with a web browser. We recommend Google Chrome. To use the Android app go to the Google app store and download the "Sportys Pilot Training App"
Thank you! Sorry, I missed that option. It works great - thanks again! Will this course work for both Sport and/or Private Pilot test prep? BEST ANSWER: Yes, the course contains Sporty, Recreational and Private test prep. BEST ANSWER: This is a ground school to obtain the Sport, Recreational or Private pilot license. It is specific for each of the licenses. If I take this course, what test could I take before joining a private pilot school for the flying portion? Could this save money if I found a cooperative school? BEST ANSWER: This will prepare you for the private pilot FAA written exam. 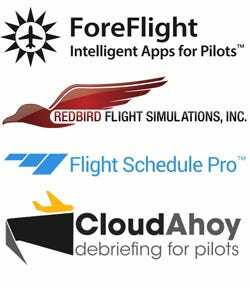 So students who take your program typically save time and money in their training with a local CFI? BEST ANSWER: Yes, they do. Intro to Flying Kit - FREE!